LeBron James admitted he deliberately charged Luka Doncic during the Los Angeles Lakers' win over the Dallas Mavericks on Friday. Doncic stunned the Lakers superstar with a surprise double block in the early stages of the meeting at Staples Center. 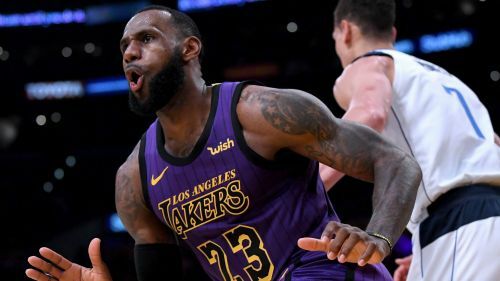 But James, seemingly already frustrated by how the game was unfolding, did not hesitate in asserting his dominance once more, before the Lakers came from behind to seal a 114-103 victory and move to 13-9 on the season. "He actually came out of nowhere to get the double block on me," James said of Doncic. "It wasn't even his man but he covered for a man. I told him 'I didn't even see you on both attempts'. "He got the charge and I seen him on that one. I made sure I charged into him on that one - I did that on purpose." James finished with 28 points - one of six Lakers to reach double figures. "We have the ability to have multiple guys who can put the ball in the basket," James added. "It comes with our ball movement and the way we play with pace. "Every game is important in this league period. If you get the opportunity to get the win then you want to and try to."